Nigel likes to annoy his work colleagues. You can't get much more annoying than stealing from them. Nigel though, has refined larceny as a medium of constructive criticism. When Oli complained about the number of pegs he received with his new tent he was informed that he had the correct number. No doubt the supplier's claim was backed up by meticulous computer modeling or extreme environment testing. Nevertheless, Oli's persistent complaining caused the company to airmail half a dozen of the precious items from California to rainy England. Best to keep these dangerous looking items out of Arnie's hands anyhow. Due to the zealous delivery from the supplier foiling other well planned japes, Nigel was forced to steal one of Oli's pegs. Obviously he asked Phil to run a quick Ebay advert. View a copy of the auction after it finished. 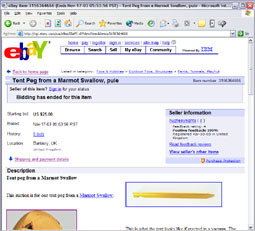 The real page may still be available on Ebay. Silly auctions are just a sideline for Blinman.com. For example, find out Fifty things to do before you're 30, or 100 reasons Nigel is angry.